Tags are some of my favourite posts to do. They're so different and fun to write after you've been writing a bunch of reviews and all that serious stuff! A few days ago, I stumbled upon this tag on My Life As Marina. 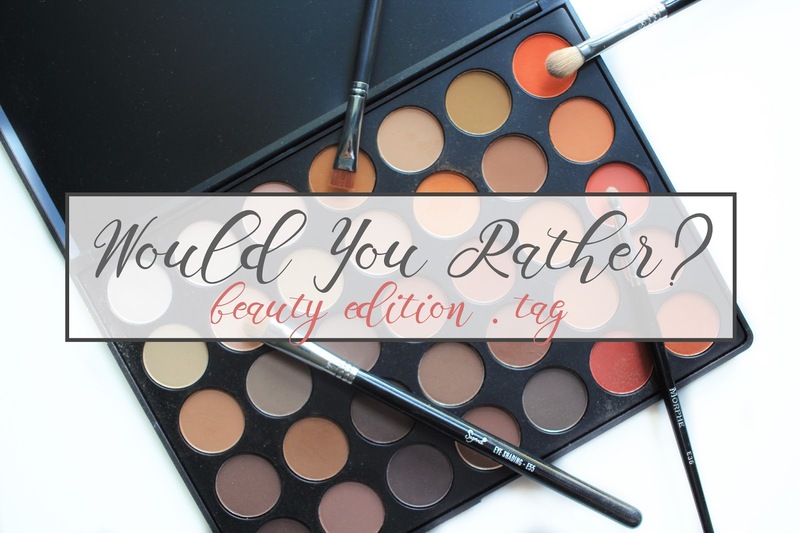 'Would You Rather' is such a fun game to play with friends and I found it really interesting that there was a beauty version. If you'd like to play along, feel free to leave your answers in the comments! O1. Would you rather lose all your mascaras, eyeliners, lipsticks and lip glosses or lose all your palettes and eyeshadows? I'd much rather go without my palettes. I feel like you can wear mascara, eyeliner, lipstick and lip gloss without needing eyeshadow, but you can't complete a look just wearing eyeshadow. O2. Would you rather chop off all your hair or never be able to cut it again? Depends. If I had the healthy hair I had a few years ago, I would never cut it again. But if I had the damaged hair that I have now, I wouldn't mind chopping it all off. It'll probably grow back healthy, right? O3. Would you rather have a coral cheek or a pink cheek? I mentioned before that I'm not a big fan of bright pink cheeks, so I guess coral would be a better choice for me. O4. If you had a 1000 dollars to spend, would you rather buy clothes or makeup? Ugh! Such a hard choice for me. I feel like my makeup collection is above average, but there's still so much I want. On the other hand, my wardrobe does need some extra lovin'.. So I'll have to go with clothes. O5. Would you rather apply lipstick as eyeliner, or eyeliner as lipstick? Definitely lipstick as eyeliner.. As long it's liquid lipstick! I actually think that's a thing. I might give it a try sometime soon. O6. Would you rather only shop at MAC or Sephora? Definitely Sephora. There's just so much more options and brands at Sephora. And I do like options! O7. Would you rather only use one eyeshadow color or one lip color for the rest of your life? I could live with just a wash of brown shadow on my lids. That's pretty much what I do everyday anyways. Plus there are so many different lip colours out there, it'd be a crime not to explore! O8. Would you rather wear winter clothes in summer or summer clothes in winter? Winter clothes in the Summer. I cannot stand the cold at all. O9. Would you rather have dark nails or bright nails all year round? Dark nails for sure. I always hated the look of bright, neon nails. They looked really tacky/rachet to me. Dark nails def looks much better. 1O. Would you rather give up your favorite lip product or your favorite eye product? Probably my favourite lip product. I feel like it's harder for me to find a good eye product than a good lip product. Messy bun. Ponytails don't look the best on me but messy buns always look cute! Lip gloss. Even though I don't do either often, I much rather have pretty nails than a glossy lip. 13. Would you rather shave your eyebrows and have none at all or sharpie them in every day? Holy crap, this is a hard one. Eyebrows is such an important thing for me but I think I'll go with shaving my them though. I mean you could always draw them in or do some microblading, right? Plus, sharpie brows is not a good look. 14. Would you rather live without make up or nail polish?